It was only a matter of time before the 2018 NCAA football season had a who’s who of breakout stars at the quarterback position. Some entered the fall camp locked in a quarterback battle while others were named the starters early, having to replace some of the more decorated quarterbacks in recent memory. No matter how they started the season, these five quarterbacks have taken the reins of their respective programs, and there is no looking back now. 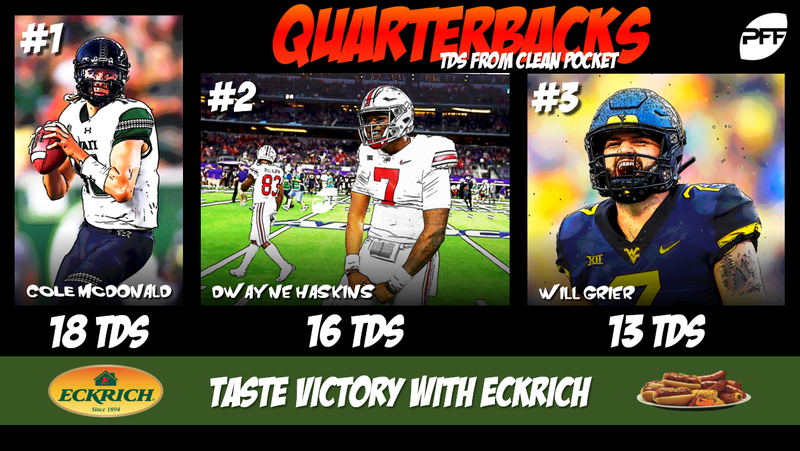 The list of breakout quarterbacks is brought to you by Eckrich, the Official Smoked Sausage of the College Football Playoff. Tagovailoa is currently not only the top breakout quarterback but also the second-highest graded quarterback across the nation with a 92.4 overall grade. His 12:0 touchdown-to-interception ratio tops the country at this point and he’s unleashed nine big-time throws compared to just one turnover-worthy pass. Tagovailoa adds a different dynamic to the Alabama offense and unlike some of his counterparts who were named starters before the season, he has now officially made Jalen Hurts an afterthought in the Crimson Tide offense. He currently leads the country with an 84.0 percent adjusted completion percentage, throwing a catchable pass on 68-of-80 attempts. 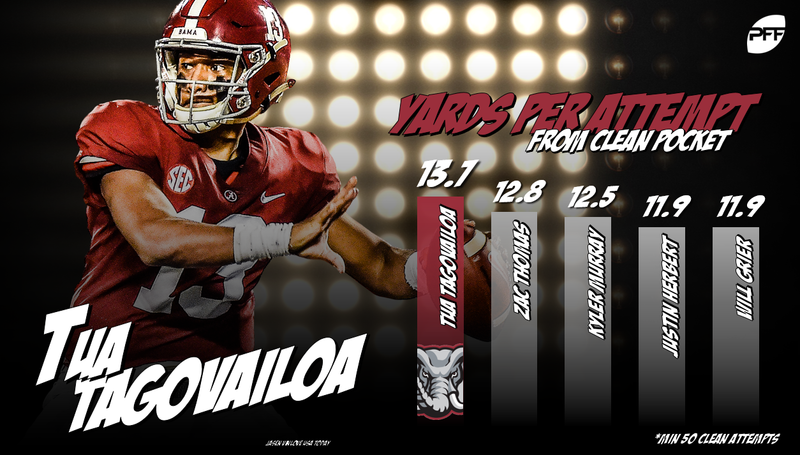 With Alabama clearly pacing the entire college football landscape this season, Tagovailoa is primed for not only the lead in terms of breakout stars but with his current path, is heading towards the Heisman Trophy. In his first game with head coach Urban Meyer back at the helm, Haskins was dominant, albeit not tasked with much in terms of downfield throwing or testing the Tulane defense. He averaged just 7.7 yards downfield per target and had only one of our big-time throws despite his five-touchdown basic box-score line. This is not to underappreciate what Haskins has done as Ohio State’s quarterback this year, rather just meant to showcase why he isn’t No. 1 on this list. Haskins has taken incredible care of the ball this season, making only one turnover-worthy pass all year long and fielding an 81.1 percent adjusted completion percentage that ranks ninth among FBS quarterbacks. Replacing last year’s Heisman Trophy winner in Baker Mayfield was always going to be a tall ask for Murray, even after he was selected in the first round of the 2018 MLB Draft. What Murray has done, though, with his connection to Marquise Brown, is throw a catchable pass on 60.0 percent of his throws targeted 20 yards or further downfield. He’s also found success riding the Oklahoma run game via play-action passes, but has done work of his own on standard passes. Without the aid of a play fake, Murray has completed 34-of-50 attempts for six touchdowns and a passer rating of 147.1, which is good enough for second in the nation (behind only Tagovailoa). The next two quarterbacks on this list may be two that you haven’t heard much about this season but that should change as we keep progressing this year. White replaces Riley Ferguson who holds several single-season and single-game passing records at Memphis including completions, attempts, yards and touchdown records that he set in 2017. White has picked up right where Ferguson left off though and is currently our 10th-highest graded quarterback in the country. He may do it a bit different than Ferguson, averaging just an average depth of target of 7.7 yards but White gets the job done. He’s been incredibly accurate, throwing a catchable pass 81.7 percent of the time, a figure that ranks seventh in the country. Having the benefit of playing in the elusive Week 0 game to start the year, McDonald has an extra game under his belt, playing five games already. Regardless of that, McDonald still completes passes at a high rate and breaking down his numbers on a per-pass, per-game basis shows that he has put forth his 5-game body of work to the tune of the 18th-highest grade at the position this season. He leads the nation in touchdown passes with 20, having been kept clean on his dropbacks an incredible 81.4 percent of the time. He leads the nation with 18 touchdowns and 1,675 yards from a clean pocket.